Was surprised on the way to home. 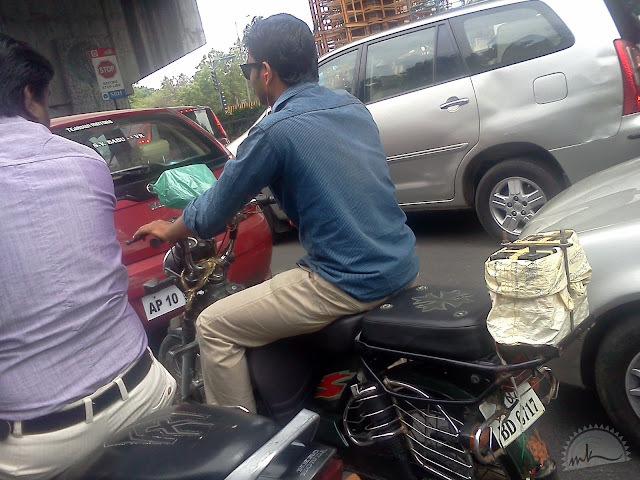 We all waited at red signal in traffic and co-traveler on two wheeler attracted my attention this time. A simple loona (Loona is the local name of the two wheeler), based on the requirements of the need he had connected an external battery at rear end which provides supply to the head lamp which is fixed at front end for more visibility in dark. Really, i loved the way he used things for routines. In-fact thought to talk to him to know more about him but soon we had green signal and people started moving very fast. Look at the way of sitting and enjoying music and to be frank all the people eyes at traffic signal are on his tvs vehicles itself.